You'd think that Pakula would be just the man to tease the intellectual and emotional depth out of a Grisham potboiler, but you'd be wrong. 140 min. Warner Bros. Pictures Distribution. Director: Alan J. Pakula. Cast: Julia Roberts, Denzel Washington, Sam Shepard, John Heard, Tony Goldwyn. 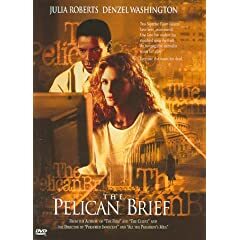 Despite a basic competence, the film adaptation of John Grisham's basically competent thriller The Pelican Brief inspires a thesaurus worth of uninspiring adjectives: boring, humorless, lifeless, listless, poky, plodding, thrill-deficient. In lesser hands than those of writer-director Alan J. Pakula (All the President's Men) and stars Julia Roberts and Denzel Washington, it seems certain the paper-thin paranoia tale would collapse like a house of cards. Roberts plays Darby Shaw, a gifted Tulane University Law School student who's also sleeping with her professor, Thomas Callahan (Sam Shepard). When two Supreme Court justices are assassinated, the curious Shaw does some research (primary source: PBS' Frontline) and pens a brief. Proudly passing her academic exercise to a friend in the F.B.I. (John Heard), Callahan says, "You'd get a kick out of how her mind works." Word gets around, and when people who know too much start dying, Shaw realizes her hypothesis—which, with pointed absurdity, comes down to a legal argument over pelicans—is too close for comfort in identifying a corporate-government conspiracy. In desperation, Shaw turns to newspaper reporter Gray Grantham (Washington, in a smart piece of color-blind casting). Grantham has the experience and savvy to help Shaw with two crucial tasks: gathering the hard evidence to get the story in print (thereby blowing the whistle), and devising strategies to keep the two safe as they do it. The ingredients are top-quality: New Orleans and Washington locations, a James Horner score, and a helluva supporting cast, including James B. Sikking, Tony Goldwyn, Stanley Tucci, Hume Cronyn, John Lithgow, William Atherton, and Robert Culp. You'd think that Pakula would be just the man to tease the intellectual and emotional depth out of a Grisham potboiler, but you'd be wrong: he's never able to light a fire with the material. Sydney Pollack (The Firm), Joel Schumacher (The Client and A Time to Kill) and Francis Ford Coppola (The Rainmaker) all fared better; for my money, so did Robert Altman (The Gingerbread Man). Perhaps the details of The Pelican Brief's narrative are simply too clichéd to get a foothold. Pakula proves too uncompromising to tart up the story with more action than a car bomb here and a foot chase there. I'm all for the "smart thriller"—unfortunately, this isn't it. The Pelican Brief is more like a TV movie with an A-list cast. For fans of The Pelican Brief, an upgrade must seem long overdue. Now on Blu-ray, the film looks better than it has since it played theaters in 1993 (perhaps even better, to those who saw washed out prints or out-of-focus projection). Warner's transfer of The Pelican Brief shows some telltale signs of an aging source: a mild horizontal shiftiness to the transfer and the application of digital noise reduction. But there's no question this wallops the 1997 DVD, especially in more vibrant and true colors and a noticeable sharpening of detail. The Dolby TrueHD and Dolby Digital 5.1 audio options also step it up from the old DVD, with solid directional effects and good, clear support of music and dialogue. No bonus features here, save for a "Theatrical Trailer" (1:57, SD), but there's no question Grisham enthusiasts will want to have this next-gen trade-up. All site content © 2000-2019 Peter Canavese. Page generated at 04/17/2019 04:32:39PM.